Each and every one of us motorcyclists has, at least once, experienced a violent jerk from the rear tyre when we downshift into a curve at higher speeds. The explanation for this is simple and understandable by the majority of us: the rear tyre is moving faster (is at a higher rpm) than the speed that the engine can provide (which is at a lower rpm). This forces the chain (or belt, or shaft) to put a back torque on the engine, which strains the engine and rapidly slows the rear tyre. Of course, this jerking can be averted by manually rev-matching the engine while downshifting. But then rev-matching isn’t everybody’s cup of tea, and even if it was, it has its own side effects such as over-revving, which directly affects the mileage and not in a good way. In comes the slipper clutch, along with the assist function to solve this problem. Here's a brief description and a few of its advantages, just in case you want to know. 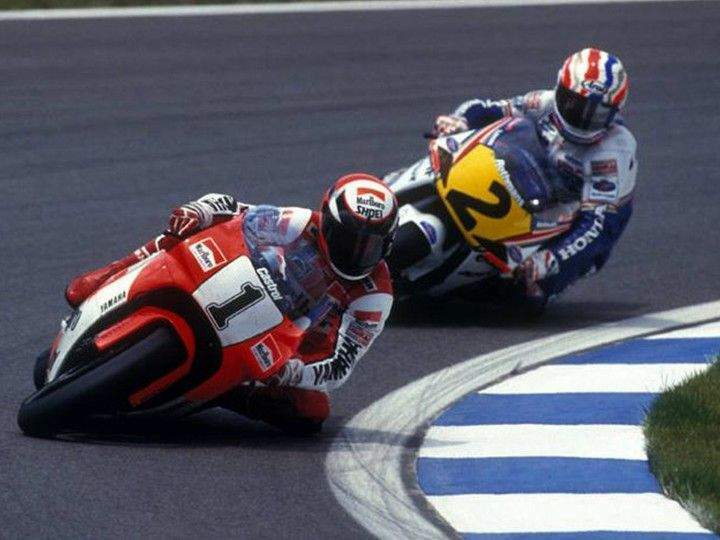 The slipper clutch was developed in early 1990, but was only available in MotoGP machines and a few high-performance bikes. As is the case with every technology, manufacturers took their own sweet time to introduce them into entry level performance motorcycles. The system eventually found its way into bikes like the Ninja 300, KTM Duke 390 and the Bajaj Dominar 400. This has made the slipper clutch much more commonplace. A slipper clutch is essentially the same clutch that a bike without a slipper clutch uses, except for the slipping function, of course. 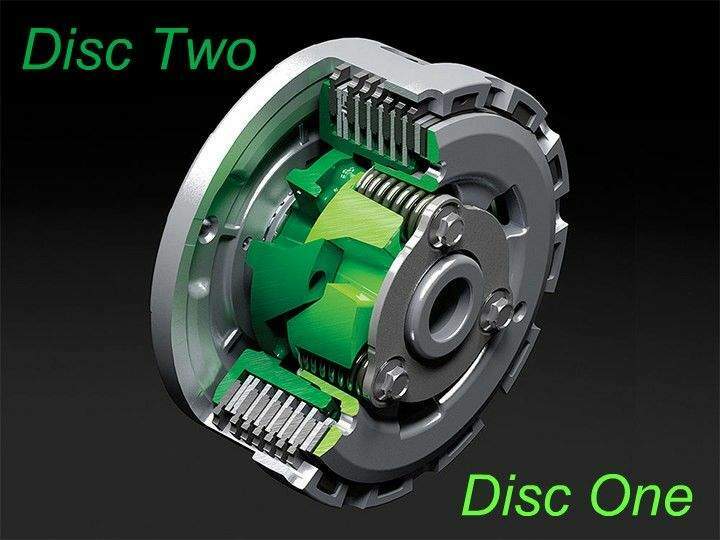 The slipper clutch, in addition to pressure plates, springs and splined case, consists of two circular discs with angled ramps (see image above). Now since these ‘ramps’ are angled, they facilitate sliding in the angular grooves created by the two consecutive ramps. Now imagine you are heading a sharp curve at a speed far greater than required. You are bound to downshift a gear or two, which will certainly cause a spike in the rev counter and a massive jerk from the rear tyre, as if somebody applied the brakes. This sudden slowing down of the rear wheel will exert a handsome amount of strain on the transmission side of the clutch. This will cause the circular disc attached to the pressure plate of the clutch to rise, as the engine is moving slower than the transmission, consequently letting the clutch plates to slip over each other and smooth out the jerk of high speed downshift, till both the transmission side and the engine side match in terms of rpm. 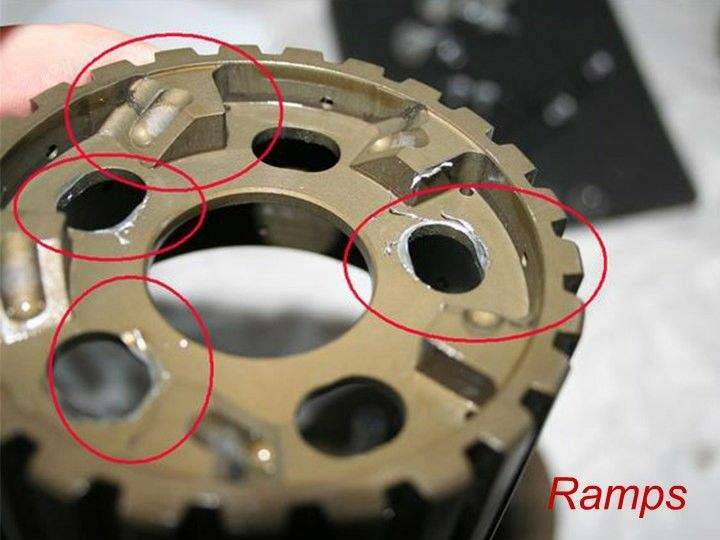 Conversely, if you are accelerating a motorcycle with a slipper clutch, the angled groove will direct the engine side of the circular disc to push in and bury into the pressure plates tightly. This ultimately transfers the power in a more efficient manner and the clutch requires fewer springs to push the pressure plates together. 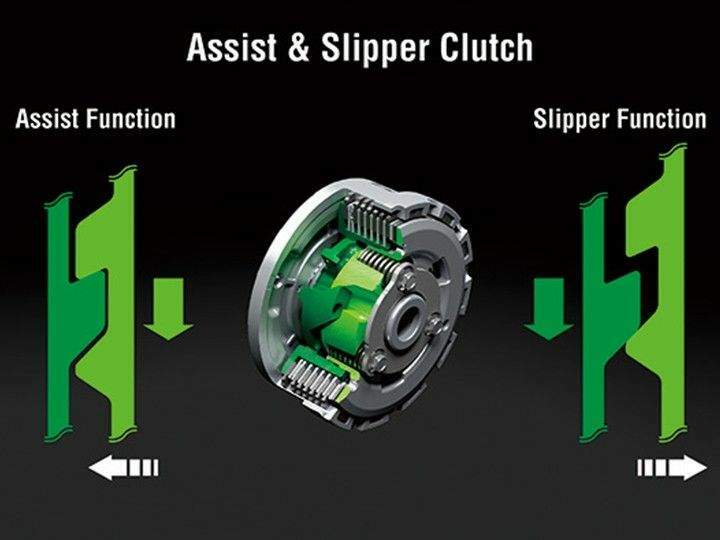 This function of the slipper clutch is also known as the 'assist'. Sometimes engine braking is crucial, such as in steep downhill rides, and a slipper clutch dilutes the engine braking effect, causing the rider to use the brake more often. So the slipper clutch has its disadvantages too; still, its advantages far exceed those of a conventional clutch. 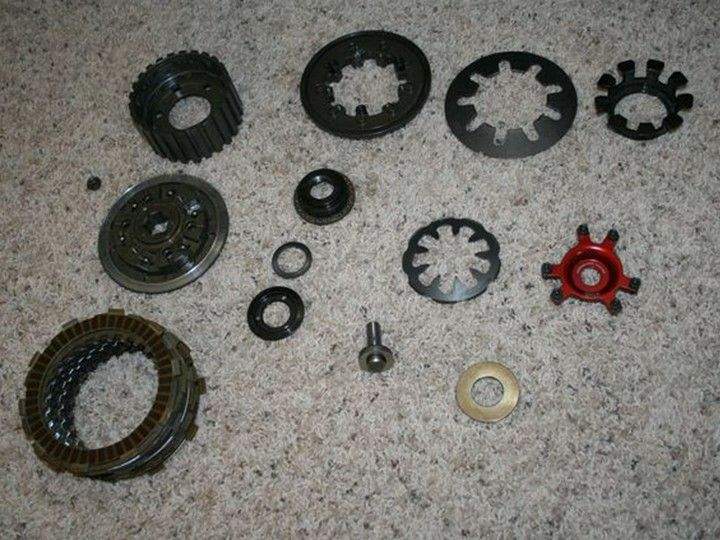 Besides, if you are into professional racing or are a little too harsh while downshifting, then a slipper clutch can certainly enhance the safety quotient as well as the quality of your ride.